Let me be honest, I love chino style pants. They fit well and feel soft when you wear them. Chinos are actually a great summer pant and can be worn with a variety of tops, flat sandals or shoes. 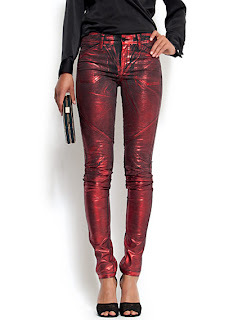 Asos has a pair of chinos for curvy women on sale for $27.58 available in navy and pink. I think these are a good buy and will definitely come in handy through out the season. The bomb Sergio Rossi sandals! And I was told that Katy Perry already owns a pair in black crystal! Woooww! 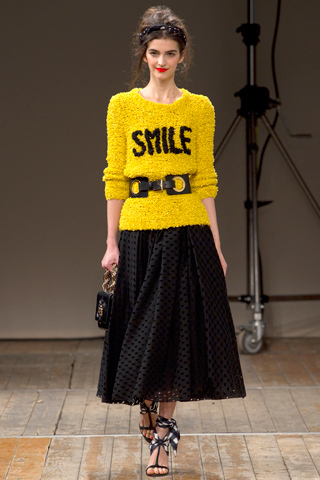 Pre-Fall Infatuation With Alice + Olivia! I love these 2 looks from Alice + Olivia for Pre-Fall 2011!! What do you think? 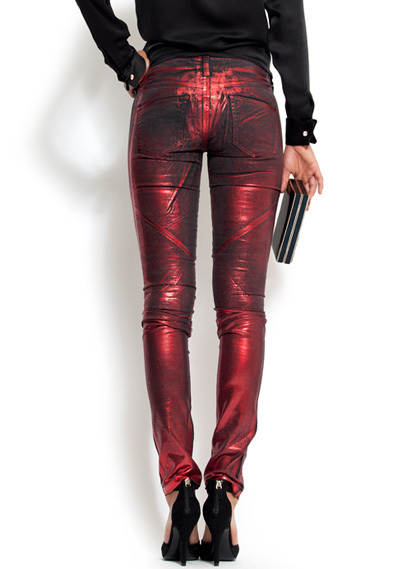 Metallic Skinny Jeans by Mango!! OMG!! 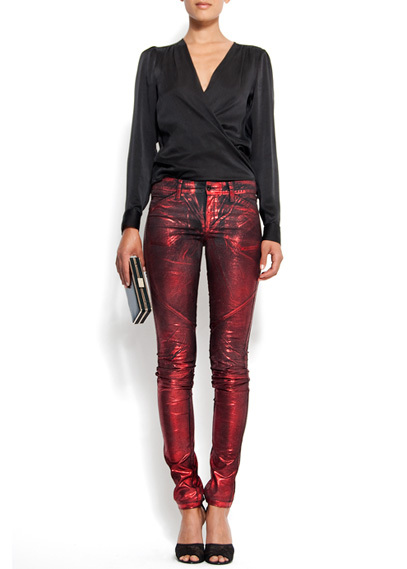 I love the color of these metallic skinny jeans by Mango. I haven't seen a pair of skinny jeans with a metallic wash to them in a few years and especially, not in a strawberry over black denim colored wash. I love them!! The price is EUR 79.95 or $115 available on-line. What do you think? Would you rock them? Prints, Leather, Studs and Rock and Roll flavor is what Versace promises H and M customers when they bring their collection to selected H&M stores come November! Check out this video for more on this wonderful collaboration! A Great Buy!! Polka Platforms in Fun Colors!! Thank you to facebook, yesterday I became familiar with a shoe and accessory online store by the name of The Shoe Latier, link here to visit the site. This site has a variety of shoes and other accessories for sale on their site, for a reasonable price. I quickly went through the site and fell in love with the pair of shoes that you see below. The shoe is a true blue color, with white polka dots, a peep toe front, slingback heel strap and dark wood platforms. The heel is 5.25" and the platform is 1.25". The price is $36.99. 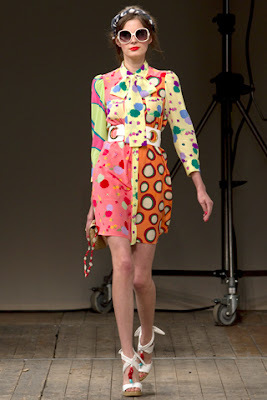 The polka dot platform, pump, and or sandal are so HOT for summer 2011. Pair this shoe, with an off color solid thin ankle sock. 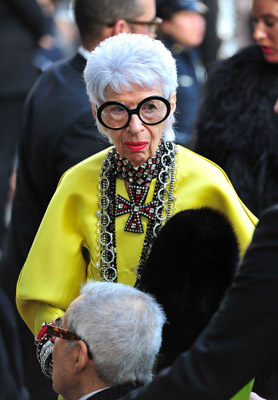 And use that same color as an accent in your outfit or accessories and you will be fashionably fierce! And Notably Approved! The Little Black Dress : Reverse! Nicole Miller recently dressed Shaun Robinson, for an Access Hollywood taping. And Nicole Miller being the trendsetter that she is did a Little Black Dress look reversed. Instead of, a little black dress, Nicole dressed Shaun in a little white dress with black pearls! Genius right? I know! 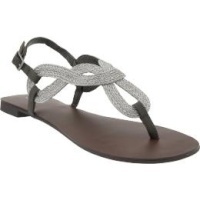 Stylish Sandals For Under $50!! Stylefind.com came up with their best list of Ultra Stylish Sandals Under $50 and posted it on their site, here. Notable Styles and More re-edited stylefind's list down to 4 of my fave pairs from their list. In this economy, it is important to have options and preferably, well priced options for our apparel, accessory and shoe wardrobes. Do you like any of these options? H&M has several looks in a variety of themes, like After the Beach, Summer, and more, from their summer collection, available on their site. Better yet, visit the H&M store and shop. I am a supporter of their fairly priced, trendy, separates and apparel items for the entire family. Tyrese Gibson "Will, Come On And Go With Me"
The Braxton Sisters Swim Into Town!! The Braxton Sisters, well, who are they? The Braxton sisters happen to be a group made up of all four of Toni Braxton's sisters, Trina, Traci, Towanda and Tamar. The four women also star alongside Toni, in their own reality show called Braxton Family Values on WETv. The finale of this season airs Tuesday at 9pm/8C. Tune in. I think its highly entertaining! The Braxton Sisters were photographed in some of the hottest swimwear and accessories for Vibe.com and for details and more info on the shoot, click here. 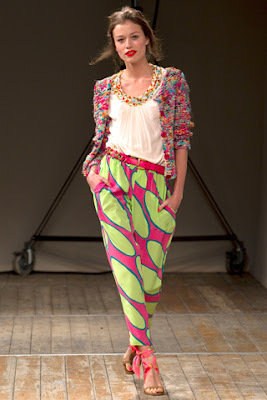 Full of Color, Style and Fun!! 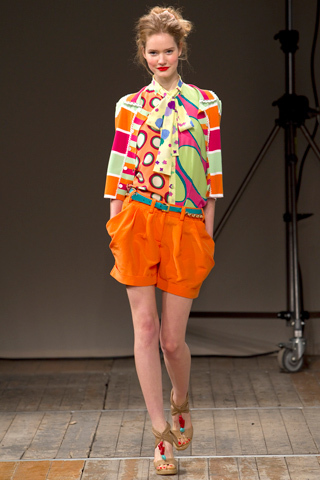 Moschino Cheap and Chic's S/S 2011 Collection is absolutely, positively, without a doubt full of color, style and fun! After Notable Styles and More review, I decided that this collection encompasses exactly what fashion is about, good quality, good design style and originality. Waist length, summer knit blazers, with embellishments in wonderful colors, paired, with light weight shorts, capris and skirts. Long and short skirts paired with summer sweaters and belts. I also love the bed hair look, headbands, the ankle tie plaid sandals and the shades. This run was a knock out of the park for me. What do you think, Notables? Jennifer Hudson Recovering Well After Being Hospitalized! Grammy winner Jennifer Hudson was hospitalized yesterday (June 10) after experiencing "abdominal pain" moments before she was due to perform on CBS' Early Show Outdoor Concert Series. Hudson, who was booked for two gigs, started feeling pains following her first performance in New York's Central Park as planned for Good Morning America. Her rep broke the news to waiting fans and photographers, explaining Hudson was "unable to perform" and had been taken to hospital to seek treatment for stomach issues. While I was out and about yesterday doing what I do, this item in the Arden B display window, caught my attention! I am about to break down, why it did. Its all white, which makes one feel pure and untouchable. It is a bandage style form fit, which tells all, in the curves but in a complimentary and sultry way. The dress is embellished with silver jewels on the shoulder straps which makes the dress wearable to fashion friendly and classy events. 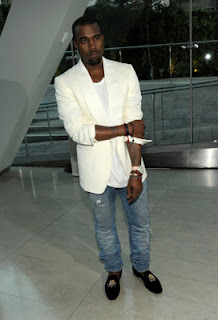 CFDA 2011 Arrival and Cocktail Images!! The CFDA's are always a great event to review to see what summer fashion styles and colors are emerging from the ranks of the American Elite Designers. The above pictures are courtesy of wireimage.com for you to enjoy! Ciao!! Vogue Italy In A More Round Fashion!